These Brazilian Soapstone Semi-pressure Cookers are quite amazing. They don't actually reach high levels of pressure, but simply slightly elevate the pressure. Their slow and even heat maintain the elevated pressure allowing food to cook a bit faster. The lid does not lock and it can actually be opened at any time. The weight of the lid is what keeps it down. They are great for making beans. The pots are handcrafted from a single block of natural, non-toxic soap stone its thick and dense walls lets them maintain an even cooking temperature. The handle of the pot has a small opening which releases excess pressure, causing the small stone weight to "dance" when cooking. In their natural state, they are light in color, however they need to be cured before its first use which will cause it to turn a darker shade of grey, but still maintain their beautiful stone pattern resembling granite. Pots can vary in color and hue from each other depending to the exact composition of the minerals in the stone therefore making each piece unique. As with most handmade products by artisans around the world, the pieces may have slight imperfections in the form or finish of the materials, however, these imperfection do not compromise the aesthetics or functionality of the pieces and are considered normal and to be expected. 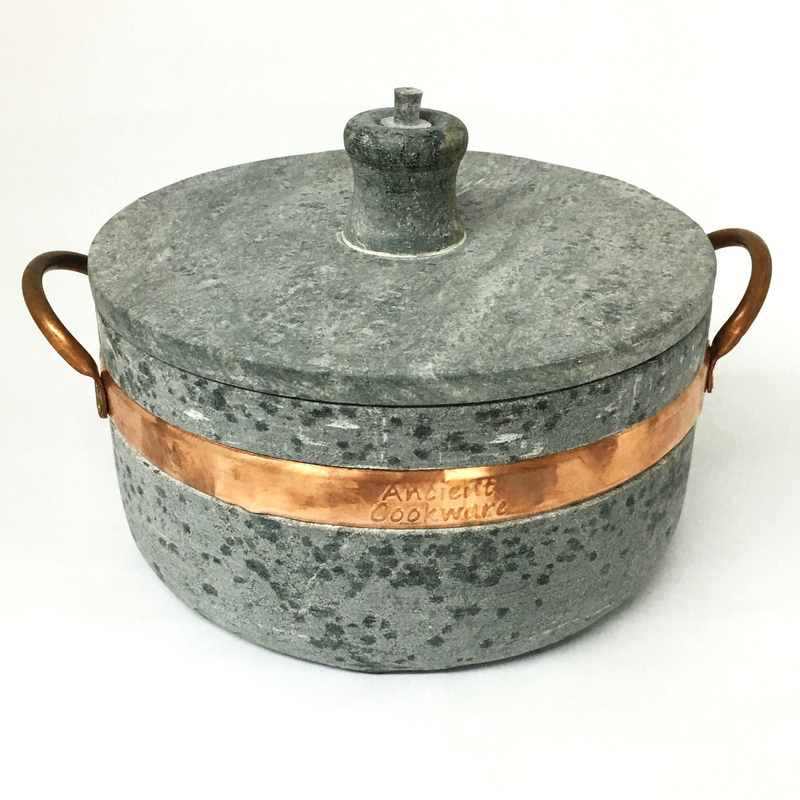 Soapstone pots can be used in the oven, stovetop or grill, and can go directly to the table for a sophisticated presentation. The pieces can be used directly on a gas or electric range, however, it is recommended to use a heat diffuser on electric ranges. The heat diffuser (which can be used with gas stove as well) has the added benefit of distributing the heat slowly to prevent foods from burning. The pots can also be used on induction cooktops with the use of an induction cookware interface disk. The pots must not be submitted to drastic changes in temperature and should be allowed to adjust slowly to heat, letting them slowly heat up until they are hot, either on the stove or in the oven. Likewise, you should also allow the pieces to adjust to room temperature before washing or storing them, and never sit a hot pot on a cold surface such as granite or tile. The pots retain heat for a long period of time, so be careful in handling a hot pot. Because of the copper handles, the pots cannot be used in microwave ovens. For cleaning, avoid using the dishwasher, hand washing is recommended. After each use, fill with warm, soapy water, allowing to soak briefly if heavily soiled, then scrubbing lightly with a sponge or soft cloth. It is a good idea to reapply some oil before storing the pot. Do not use metal or abrasive pads as they may scratch the surface and avoid strongly scented soaps which can flavor the pot. Use wooden utensils with the pieces as metal utensils can scratch and damage the inside. Before a Soapstone Pot can be used for cooking the first time; it should be “cured”. The curing process not only seals the pores of the stone, but it also further hardens the soapstone and makes it last longer. It also makes the pot more resistant to sticking. Since it the color becomes more intense and a darker shade of grey, some people feel they are even more beautiful after the curing process. To begin the process, rinse the pot well under running water to remove any dirt left over from the manufacturing or shipping process, and let completely dry. Heat your oven for about 20 minutes at 350 degrees. After the pot is completely dry, coat the pot and lid both inside and out with a generous amount of your choice of cooking oil. Make sure to do both inside and out so that it keeps a uniform color, and of course be careful handling an oiled pot and lid. The best tool to use to coat the pot is a pastry brush heavily laden with oil. Turn the oven off, and place the pot in the oven and let it rest until the oven cools down, preferably overnight. This procedure should be repeated for three days, after which you can rinse it well under running water, and begin enjoying your Soapstone Pot. Along with the cool fall weather comes the need for some warm, comforting dishes, including this quick and hearty Brazilian Corn Chowder— Sopa de Milho Verde in Portuguese. If you have ever tasted an American Corn Chowder, I know you will become a fan of this soup.